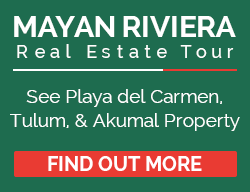 Checking Out Beachfront Mayan Riviera Real Estate in Tulum, Akumal, Playa del Carmen…. With the flash of a flicker of light, the wafting smoke trail rose deep into the perfectly clear, starry night sky. My exquisitely cut Cuban Montecristo was now afire, as the cacophony of sounds swirled around me. The perfect ying and yang …Zen… really. The excitement of the energy around me was just as intense, as the relaxation from puffing away at a perfect cigar. All that was missing was the perfect libation, but all I had in front of me was a nicely topped off cappuccino. Pleasurable as the moment was, I was here for business to check out beachfront Mayan Riviera real estate for sale. Specifically the Bahia Principe Residences & Golf real estate development. The sounds and sights around me, engulfed the senses. A blaring band was knocking out tunes…no, not Corrido, or Son…and certainly not Mariachi music. This is the real Mexico…today’s Mexico. We aren’t in a Quentin Tarantino movie. The band was blaring USA Diva music – Mariah Carey, Donna Summer and Madonna. The lead singer, an attractive local area Mexican, was belting out the diverse songs fairly well. The crowd was into it…dancing, whirling…singing along. Canadians to the left of me, Russians to the right…dead ahead an American couple that looked plucked straight from Dancing with the Stars. The Maya Riviera definitely has got talent! The bar staff was attentive, without being intrusive. The palms softly swayed in the gentle breeze of the night. The breeze cut to the bone, just a bit. For the regular readers…remember? This former Chicago boy has become a complete wuss. Temperature drops to 65º F and I am reaching for the parka. The temperature in Tulum, Mexico was right around 65º F that night. That is a cold wave for the region. Hey, I never promised the readers “Cinderella” and things aren’t always perfect. 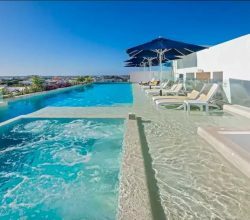 However, they were as close to perfect as you get, while sitting at the stunning Bahia Principe Hotel complex, on Mexico’s gorgeous Caribbean Coast. After watching the show for about 30 minutes and thoroughly enjoying the Montecristo, it was time to move along. Late as it was, I had two more business meetings left to go that night. Allow me to digress. I had arrived at Cancun International Airport two days earlier. A group of us were there to source beachfront Mayan Riviera real estate opportunities and to follow up on a special and unique project that, once the final ink is dried, I absolutely cannot wait to present to our loyal readers. Fabulous is just a word…this is something to behold, boots on the ground. I was staying at the Bahia Principe courtesy of the machinations of the “Big Kahuna”, himself, Domingo Silvas, the CEO of EscapeArtist. Domingo does things right, so there was zero doubt this would be an experience to remember. On the road from Cancun to Tulum, where the Bahia Principe resides, I couldn’t help but notice one of the many conveniences that the region offers. It is impossible to get lost going from point A to point B. No, seriously, consider this a challenge. Take your worst driver or your most geographically challenged spouse, friend or business associates, hand them the keys to a rental car at Cancun International Airport and tell them to find Tulum. I bet they get there in a heartbeat. All roads from the airport point to the main drive road, from Cancun to Tulum. It is basically almost impossible to leave the airport and not be on the right road. From there, it is a straight line shot directly down, passed Playa del Carmen, passed Akumal and right into Tulum. In fact, the way the road is designed, it is almost impossible to even veer off it, for a pit stop. This road is “idiot proof” and I am the most directionally challenged person in the world I know. Odd…yes…especially given my profession and the extent of my global travels. Fortunately, we didn’t even have to drive ourselves. Our local host arranged the most amicable, knowledgeable, bilingual and talented of drivers and guide to bring us to our final destination…the Bahia Principe beachfront resort. It was there that our business journey was to begin. I won’t burden our readers, however, with the tedious numbers crunching and the endless hours of mind-numbing driving that go into sourcing real estate opportunities. However, I will share with you, how this special slice of paradise, known as the Maya Riviera, unfolded before our eyes. There was no time to spare. We pulled into Bahia Principe just passed noon. Still, we wanted to get in a half-day of exploration. What we soon discovered was that it could take a half-day, just to explore the massive Bahia Principe real estate development project. In fact, it did. The hotel, resort, residential and multi-golf course project is so massive, it sits on both sides of the highway. There is the beach side and then the even grander, newer portion of the project, which lies about 1 Km, just the other side of the road. A continuous and well orchestrated shuttle service, takes folks from the beachfront, back to the jungle setting location, and those from the jungle setting location, across to the beachfront. Back and forth…back and forth…day and well into the night. It is a service offered that is handled to perfection and extremely convenient. This feat is made possible by, quite literally, the only bridge span across the highway, which links the beachfront to the jungle side of the road. Bahia Principe spares no expense or convenience for its guests and residents. As we headed, along with our gracious hosts, to the beachfront of Bahia Principe real estate development, we explored its many beachfront hotel options. For me, however, it was all a blur. One gorgeous beach, with one amazingly attractive hotel after another. So, for me…I distilled it down to that “one thing” – Tequila. Ok, ok…I know what you are thinking, but remember, when we flash forward in this story, I am just sipping on cappuccino. This was no ordinary Tequila…this was a coconut flavored Tequila. Know me for about 5 minutes and you will understand I have a serious “coconut jones”. Mounds candy bars. Coconut ice cream. The perfectly textured macaroon. If there was a “Coconuts Anonymous”, I’d be there. To friends, I even referred to this motley crew I was traveling with as “The Coconut Cartel”. As we wandered this new, immense lobby, of yet another exquisite Bahia Principe hotel, we walked right into a guy, with a Tequila stand. This was no modest Tequila stand. There must have been 15 Tequilas lined up, all ready for a sample, courtesy of the hotel, said owner that apparently made and marketed the stuff. My eyes first caught a glimpse of a Habanero Tequila. I could only imagine the taste explosion in my mouth and the aftermath in my gut. Tempting, but sanity kicked in quickly. Likely, 20 years ago, not so much. Then…there it was…love at first sight. The label and my eyes met. A coconut Tequila. Mind you, back in my Chicago days I knew two Mexican restaurant owners that were grade school friends. We emptied a silly amount of Tequila bottles over a lifetime, but I had never seen a coconut Tequila. Sampled it…fell in love. It dominated my conversation for the day. Pulling myself away from the power of the coconut, the group of us reflected on our first half-day journey, from the comfort of the cushy and grand hotel lounge. We had not only worked up a thirst, but a good appetite as well. That was fortunate, because when our hosts ushered us into the Grand Buffett, it was like being at a Roman dinner, sponsored by Emperor Caligula. This was not your grandmother’s concept of a buffett. Everything from exotic seafooods, to perfectly sliced, sumptuous roast beef, to a perfect Spanish Paella option, all overwhelmed our senses of sight, smell and, ultimately…taste. For me, I beelined to the paella. May have knocked over a patron or two that way, but hey…it’s food…I was hungry and no one usually criticizes my aggressive nature. Ok, maybe the latter part isn’t precisely accurate, but you have to see this spread. Incredible. That’s before you get to the two tiers of desserts, on two separate sides of the aisle. If you can’t satiate your sweet tooth here, your condition is worse than my coconut jones. After dinner and a spirited conversation with our hosts, regarding all we had seen at Bahia Principe, we were promised that the next day would only get better. It was a boast I doubted. I was wrong, in more ways than one. The next day began with the most dramatic site tour and then follow-up presentation for an exclusive, luxury real estate project in the region. Think golf course, jungle nature habitat, amenities galore and all for a reasonable price, made a startling bargain, if you use the property only part of the year, then place it into one of the most professionally handled and administered rental programs I recall seeing in 31 years of doing this. Très magnifique! I don’t know…suppose it was the Riviera influence of the whole Maya Riviera thing. Brought out some French in me. Point is the project was marvellous, yet, for now, it must remain tightly under wraps. Fully, hush, hush. The EscapeArtist version of Area 102…like Area 51, only twice as secret. From there, we hit the road, Jack. First main stop…Akumal. What can I say? I am convinced that standing right here, at the gateway of the Caribbean, in the heart of Akumal, (You can check out Akumal real estate listings), is where the “Maya Riviera” was born. Exotic blue waters, dramatic beaches and “Mansion Row” – one fabulous upscale estate after another. 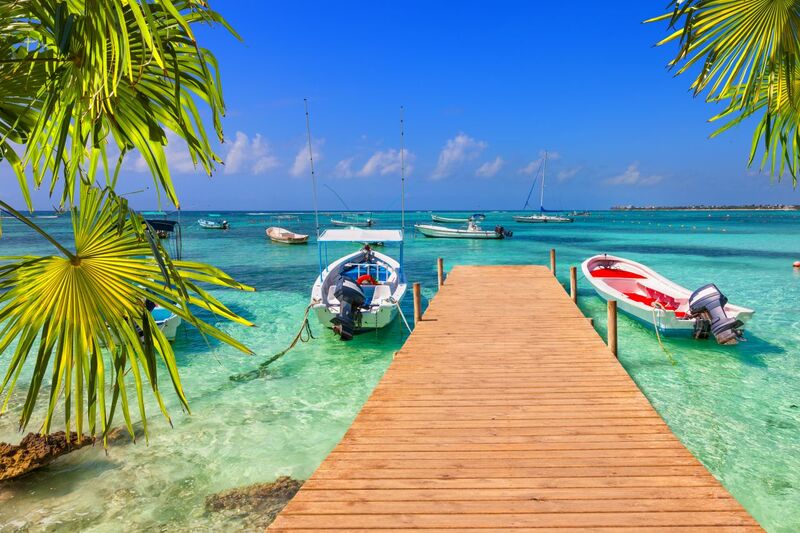 Quiet, peaceful and beckoning to the “family-friendly” audience, Akumal is a sedate paradise on the Caribbean. Still, even though it was not yet high-season, the place exuded energy…subdued energy, but none-the-less palpable. Picture palm-lined beaches, strewn with occasional cafes. A quaint ice cream shop on a walkable brick paver street. Upscale shoppers buying produce from the local street vendors…and, of course, the mad dash to beachside for the great sand turtle contest! Huh? What? Yep…sand turtles. Allow me to explain. Sand turtles are big everywhere along the coastal region of the Maya Riviera. They are deities in Akumal. I am not quite sure how much of this is fact or legend (Now queue up your favorite Quentin Tarantino bar scene), but apparently long before any humanoid invaders…errrr…inhabitants…came ashore in Akumal, this was the land of the giant sea turtle. Apparently the locale makes for a perfect nesting ground and habitat for large sea turtles. Look, who am I to quibble with nature? Remember? Chicago boy, here. For years I thought steel girders were what folks referred to as “tree trunks”. Want nature, tune into Wild Kingdom or a Bear Grylls adventure. All I know is that as if silently called by a siren, at one specific moment of my visit to Akumal, stampedes of families charged to the beachfront and began madly constructing sand turtles. I mean…you know…turtles made from sand…as in sand castles. Ever read the book or see the badly made TV movie series The TommyKnockers, of Stephen King fame? It was kind of like that, without the high spooky element. The apparent goal was to build the most elaborate sand turtle possible, in the shortest period of time. Some of them were…well…amazing. Smart guy, here, left the camera back in the room. No sand turtle shots, but…trust me… it was enthralling. Wanted to stay until the end…see who won…was there a prize? Some mysteries in life remain, as I was soon yanked away to continue our journey to…Playa del Carmen. Remember when Playa del Carmen was half-a-step up from a rum-soaked, fishermen’s town with the ambience of Appalachia? Well, if you do…it proves you are as old as I am, because this isn’t “that” Playa del Carmen anymore. 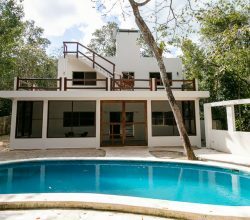 If Akumal is “quiet chic”, then Playa del Carmen is in your face, New York-style chic, if New York had a building height restriction of like 4-stories. Think the New York comparison is a bit much? Well, then how do you account for the strange 5th Avenue synergy? Yep, Playa del Carmen’s main drag is known as…5th Avenue (Avenida 5 or Quinta Avenida). This global hot spot zone covers about 40 blocks – yes, you read that right – of shops, cafes, restaurants, bars and entertainment, all encased in palm-lined streets and balmy breezes. Take that, Big Apple! We pulled in from our Akumal adventure, about an hour before dusk. Zipped about through a handful of real estate projects we reviewed and then did the all too typical thing – headed for 5th Avenue. Pulling in after dusk, the nighttime ambience was in full bloom. Shoppers lined the stores, couples walked hand-in-hand along the streets, the lucky savoured delectable Mexican hot chocolate concoctions and for us…well…we opted for cervezas and savoury appetizers. We actually sat a spell…took in the sights, savoured the refreshing coolness of an ice cold beer, while munching on chicharron de calamari, which is a derivative of a traditional pork dish, where the calamari is fried, but not until truly crispy, spiced aplenty and served with warm tortillas to fill. Hard to describe the taste sensations, but my mouth still waters when I think of it. The advantageous vista offered us a sight of the entire 5th Avenue expanse, as we talked real estate and the beauty of the region for hours, before heading back to the ranch…Bahia Principe. This same night, I puffed on that Montecristo…headed off to my two late night meetings, which went on to about 1:30 AM, and finally drifted off to sleep. Beep…beep….beep…beep. That annoying sound that can only mean one thing…6:00 AM….rise and shine, This next day I awoke early, because I knew it would be the most exhaustive day yet. 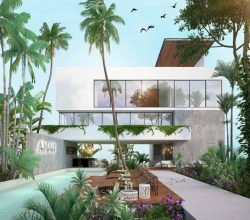 We were going to focus full throttle on Tulum, proper, and then see a bevy of additional real estate opportunities scattered about the Riviera Maya. I showered, hastily threw on the days clothes…grabbed the camera and essential materials needed…and rushed out the door. Didn’t want to be late. We were meeting at 7:00 AM, quick breakfast and on the road by 8:00 AM at the latest. I rushed into the reception area where we were ready to meet and promptly discovered that my alarm had somehow reset back to “home time”. I had shown up an hour early. It was only now 6:00 AM and, yet, two of my colleagues were already busy working on plans for the day. Hard working bunch. After another royal feast for breakfast, we headed off to Tulum. The probable “jewel in the crown”. Green, lush, with breathtaking beaches and crystal azure waters. The place has an “island feel”, married with the famed Haight-Ashbury District of 1960s San Francisco fame. Laid back…serene…a place where the lights literally go down at midnight. Yep…as in…they kill the electric at midnight. No, no…no…noone forgot to pay the bill. Remember that whole “lush and green” thing…well, the people of this area are devoted to nature conservation. The lights go out in Tulum, in order to conserve energy and give back to the lush environment that sustains the region. Yet…against this bucolic wilderness backdrop, the restaurants and cafes fill up at dusk, with folks wearing outfits one would expect to see at a New York Broadway premiere. Behind that “aw shucks” veneer, lies a population that is living well…and at night, they don’t mind a little flash…just for the fun of it! It is an almost surreal scene…the quintessential “laid back beach” stands back to reveal the dazzling evening gowns, rolex watches and a price menu that can provide sticker shock to the uninitiated. Now, to be clear, that is the beachfront strip “Tulum life”. Step back a ways…two to three blocks, and you will find appetizing bargains galore, of eternally more authentic cuisine. Pick your poison…each offers its own divinity. While there are many facets of Tulum to tempt and beckon, I was most awed by the grand system of hidden cenotes. There is no way to better describe these marvels of nature than to suggest that cenotes are the sacred waters of the Riviera Maya. Cenotes are created by an underground river system, quite literally unrivalled anywhere else in the world, which creates random, and often well-hidden in the dense jungle, pools of freshwater. They are nature’s swimming pools. Pristine…clean…fresh…the least disturbed such clear blue that one can actually see all the way to the bottom of the freshwater pool. Local area families, for eons, have used these cenotes as swimming holes, where one can take a respite from the heat and humidity that comes at certain times of year. 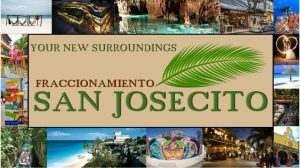 There are actually four different kinds of cenotes – those that are completely underground, those that are semi-underground, those that are at land level forming a lagoon or pond, and those that are open wells. Some of them are accessible for swimming and cave diving, some of them are not accessible at all, and some actually dry out and become cave systems that can be explored. Tourists come from around the globe, just to explore the massive cenote system in the region, which like snowflakes, no two cenotes appear exactly identical. I was enthralled, as we followed our guide into the jungle setting, to see one of the hidden wonders. For me, Tulum bears exploration…time and again…just for the diversity of cenotes. I didn’t want to leave this section of Tulum…there might have even been a tear. Yet, I knew we had to press on for the day’s targeted real estate sourcing journey. Still, not before one last Tulum stop. We followed our guide to…I swear I am not making this up…the most ramshackle looking beachfront bar that one could possibly find in all of Tulum. That was the view from beachfront. However, that is why we entrusted our knowledgable local hosts to lead us, every step of the way. Once inside you could not avoid noticing three things: 1) The most breathtaking ocean view; 2) An inspiring backyard garden that seemed a place where Martha Stewart was locked away and forgotten for a decade; and 3) Well priced drinks of all shapes and sizes. Yeah…I know…a theme. Ok, so I admit it. We still had a whole half-day of business ahead and that was before the nighttime meetings…but…come on, I am human. With the tune of Margaritaville somehow dancing through my head…I ordered the Mango Margarita. Can I say…if ever on tour with our host for the day, Luis…and this man mentions, “I know a place in Tulum…just shut up and follow him.” The Mango Margarita was scrumptious. I don’t think anyone in our party complained about their particular brand of “fruity drink”, before we marched onward on the real estate trail. By the end of this day…well…exhausted does not cover it. However, we were sure that we had seen paradise and it wasn’t a hallucination. The Maya Riviera isn’t just “beautiful”, this was “beautiful’s” better looking sister. The place dazzled, beguiled and even inspired. For about 13 minutes there, I think I imagined myself Ernest Hemingway. The place has that magical, almost spiritual, hold on you, where you dare to dream…and, better yet…yearn to make those dreams a reality. While the rest of the trip devolved into meetings, planning and strategy sessions, never reaching the sensory heights of the first three days, it was an experience that will not soon be forgotten. To our readers, I only hope we can share the reality of this likely new project we will offer, in the very near future. 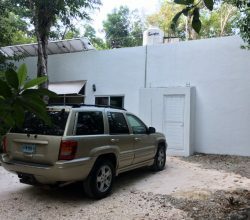 For the impatient, I do have a recent new listing in Akumal, for one of the oceanfront mansions. Not cheap, but I truly believe it is the best value piece of real estate in Akumal. My expectations is that with a 3-7 year hold, the property will double in value from the asking price and the same owner, even has the lot next door available, if someone wanted to “double dip”. 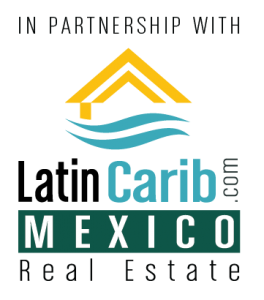 Check out more information on the Bahia Principe real estate for sale in Akumal Mexico. 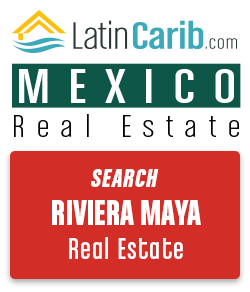 And you can see many more beachfront Maya Riviera real estate listings here: Mayan Riviera real estate listing.